Our comprehensive range of Chocolate Packing Tray is delivered by us in bulk and within a specified time period. To meet the diverse demands of the customers, we offer these trays in numerous beautiful patterns, attractive shapes and sizes. Due to their Eco-friendly, hygienic and are durable nature our entire range is largely demanded by the customers. 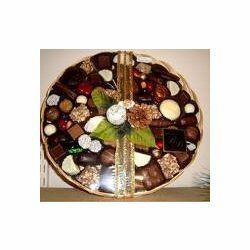 Moreover, the chocolate tray is meticulously designed with glossy flowers and buttons. We "Ratan Lal Gupta Gotewale", established in the year 1960. Owing to our high quality products, we have created a well reputed niche for ourselves in the industry with the domain of manufacturing, trading, supplying and wholesaling of Packing Products & Wedding Accessories. Our products are delivered to the clients with utmost satisfaction through which, we ensure the quality parameters and service life of the products. Our product range includes Handicraft & Wedding Accessories. These products are excellent in designs and are also admired for their different attractive patterns and beautiful shapes. With the vast expertise and excellent industry knowledge, we have attained a specific position amongst various reputed companies. Our organization is highly incorporated with a skilled team of personnel who work round the clock for gaining maximum client satisfaction. We procure our entire range from the well reputed manufacturers who use the finest grade raw material in their fabrication process. For maintaining a strong relationship with the clients, we deliver the consignments exactly according to them and also within a promised time frame.